Charlie in Fraction City is the latest children’s story in the Math MileMarkers® book series. This cheerful story uncovers the secret to an in-depth understanding of fractions. It’s generally the parts of fractions that get all the attention, but this simple kid-friendly story seeks to set the record straight by identifying the true hero in fraction world, the whole. Math MileMarkers has created an endearing story that addresses some of the foundational skills introduced in the Number and Operations-Fractions, many of which are often misunderstood. In this adventure, a group of lively soon to be unit fractions set out to find their place as part of a whole. Charlie, a highly recognized whole club president, is there to help each fractional piece understand what it takes to be a unit fraction. In doing so, these fractional characters uncover key terms in the fraction world and learn that they really don’t know their true value until they find their place as part of a whole. ​All books in the Math MileMarker series come with an educational component that identifies the learning standards addressed within the story and a narrative outlining the mathematical journey children will take as their learning progresses. Each book closes with a Math MileMarkers section which contains a task or question that a child might encounter related to each standard or mathematical skill. Lynda Brennan’s ‘Charlie in Fraction City’ (2016) follows Charlie, a rectangular-shaped president of one of the ‘whole’ clubs in Fraction City, in his attempt to find new members to join his club. There are a few catches: those who wish to join Charlie’s club have to come in a team; team members have to be identical and they must be able to perfectly fit into the club’s shape. 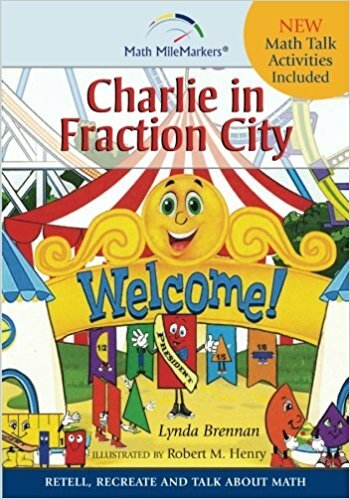 While there are many story-picture books in the market on fractions, ‘Charlie in Fraction City’ is one of the few that focuses specifically on explaining what unit fractions are and their properties – visually. Moreover, the story also provides opportunities for discussion on equivalent fractions. The story cleverly uses common misconceptions to show, for example, why even when different shapes can perfectly fit into a rectangle, they are still not considered as unit fractions. The book’s companion website also provides useful downloadable resources (e.g. a storyboard template, a ‘talking points’ guide for teachers and parents). There are a few aspects of the story to consider. The pace of the storytelling on the first eight pages (i.e. a third of the story), with a focus on ‘setting the scene’, is quite slow and could have been written more concisely, while the pace of the remaining of the story is slightly too fast with a lot going on (unit fractions, denominator, numerator, etc.). We occasionally had to pause our reading to work out what is happening. Moreover, some sentences are arguably too advanced for the intended readers and have a textbook tone to them e.g. “Charlie’s whole was a finite space that could be subdivided into a multitude of different fractional variations”. Finally, due to the context of the story, it unfortunately has messages like “Charlie […] is happy to help these fractional pieces find fractional friends, friends that look just like themselves” and when a half-circle Bella was turned away by Charlie, she was told “Perhaps you wan to try Sally Circle’s club. I know she is looking for members just like you”. From a mathematical perspective, the rationale for these messages is entirely understandable. That said, young children may subconsciously (and mistakenly) learn from these messages that being different is bad.